← Don’t judge? Where does it say that? Let’s imagine going back to the time of Yeshua. You are among several men and they are standing around talking about the amazing things they have seen or heard about concerning a man named Yeshua. Some “other” men overhear these conversations and decide it is up them to explain what they had just overheard to the “others” around them. Their mockery and ridicule wasn’t lost on those that heard them in that generation. It is not unlike Korey Visser’s ridicule, in the viral Youtube video, of the woman street preaching. His mockery and ridicule is not lost on this generation as the video he posted back in 2008 has had 3,270,654 hits so far; 41,174 likes and 1.873 dislikes. There have been many mirrors of it – it may been have already been seen by 10-100 million people by now on other sites that host the video too. No way of knowing – but it is huge. In the video, instead of him saying “They’ve just had too much wine!” like the “others” did in Acts 2 above, Korey states “You ain’t got no pancake mix!” Different words used at 2 very different times with the same goal: Make a mockery of – ridicule! said that those who received the Spirit at Pentecost were drunk with new wine, denying the work of the Spirit. Thoralf Gilbrant, ed., “2066. ἕτερος,” in The Complete Biblical Library Greek-English Dictionary – Delta-Epsilon, (Springfield, MO: Complete Biblical Library, 1991), WORDsearch CROSS e-book, Under: “2066. á¼•Ï„ÎµÏÎ¿Ï‚”. and kneeled in mock worship of him. and led him away to be nailed to the execution-stake. Did you hear? The child’s mother was a virgin! Did you hear? Yeshua healed a man with leprosy! Let’s put it in a more of a “today” type perspective. Did you hear Yeshua calmed a stormy sea just by reaching out his hand? Did you hear about the demon named Legion that begged Yeshua not to torture him? Did you hear about that girl that died? Yeshua said she was just sleeping and he woke her up! Did you hear how Yeshua fed 5000 men and their families with 5 barley loaves and 2 fish – that they had enough to eat – and that 12 baskets of food were left over? Did you hear that 4 days after Lazarus was dead, Yeshua brought him back to life? Did you hear that on the 3rd day Yeshua rose from the grave? 2 you are to take the firstfruits of all the crops the ground yields, which you will harvest from your land that Adonai your God is giving you, put them in a basket and go to the place where Adonai your God will choose to have his name live. 3 You will approach the cohen holding office at the time and say to him, ‘Today I declare to Adonai your God that I have come to the land Adonai swore to our ancestors that he would give us.’ 4 The cohen will take the basket from your hand and put it down in front of the altar of Adonai your God. It is NOT by coincidence that it is on this day that the sky roared and the wind was violent. It is NOT by coincidence that on this day tongues of fire came to rest of each of the believers as they were filled with the Ruach HaKodesh and began talking in different languages as the Spirit enabled them. It is NOT by coincidence that on this day “religious Jews” from “every nation under heaven” were in Yerushalayim (Jerusalem). It is also limited to Luke and Acts in reference to “devout” Jews (e.g., Simeon, Luke 2:25; Jews attending the Feast of Pentecost, Acts 2:5; those who buried Stephen, Acts 8:2; and Ananias, Acts 22:12). It is obvious that Luke used eulabēs in an extremely positive sense. Thoralf Gilbrant, ed., “2107. εὐλαβής,” in The Complete Biblical Library Greek-English Dictionary – Delta-Epsilon, (Springfield, MO: Complete Biblical Library, 1991), WORDsearch CROSS e-book, Under: “2107. Îµá½Î»Î±Î²á½µÏ‚”. they were confused, because each one heard the believers speaking in his own language. Imagine being a “religious Jew” with a different language than that spoke in Jerusalem. Would you be confused if Galileans were speaking about Good News in your own native language? You would be amazed, wouldn’t you? You would wonder how it was possible, wouldn’t you? Acts 2:7-11 (CJB) 7 Totally amazed, they asked, “How is this possible? Imagine being a “religious Jew – a devout Jew” on Festival of First Fruits hearing men talking about the great things God has done, in your own language, even though they are from Galil. If you were a religious Jew, you would be amazed! You would be confused! You would wonder what it meant! Wouldn’t you? But unbelievers wouldn’t. An unbeliever would mock the miracle of the Good News that Kefa (Peter) and the other believers were sharing in many tongues about the great things God has done. These “others” would poke fun just like they did when they spit on our precious Lord, wove a crown of thorns on his head, hit him and knelt in mock worship of him. It is amazing to me that people arrive at the teaching of being drunk in the Spirit from these verses! You have to take a largley eisegetical approach to the text here to come up with “drunken glory” as Todd Bentley teaches. Browne, Johnson, Copeland – the list is long here. Is it heresy? You tell me. Is it an eisegetical approach to Acts 2? Without a doubt! The “other” or “unbeliever” that mocks God and His people the believers? False teachers that introduce destructive heresies among the believers? “You Judeans, and all of you staying here in Yerushalayim! Let me tell you what this means! Listen carefully to me! that the patriarch David died and was buried — his tomb is with us to this day. that it was he who was not abandoned in Sh’ol and whose flesh did not see decay. 32 God raised up this Yeshua! And we are all witnesses of it! Praise Adonai for giving us His son Yeshua!!! This entry was posted in Word Studies and tagged acts 2, acts 2:13, christianity, drunk, even if, Jesus, kefa, Korey Visser, pancake mix, peter, spirit, unbeliever, Yeshua. Bookmark the permalink. 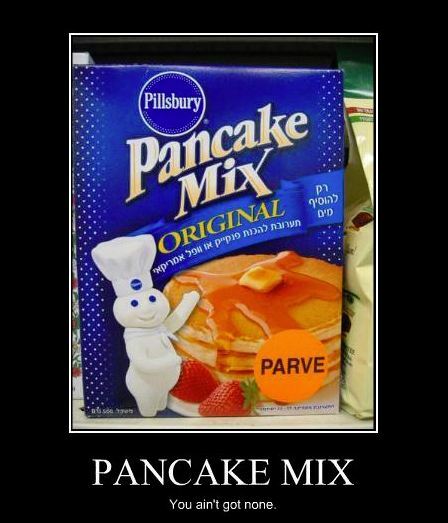 1 Response to You ain’t got no Pancake Mix!